As a celebrity chef and host of Food Network's Good Deal with Dave Lieberman, Chef Dave teaches people to live and eat well on a budget. Recently, he also teamed up with St. Francis Winery and Vineyards for their Savor the Flavor campaign that paired great barbecue with St. Francis wines. In this exclusive LoveToKnow Wine interview, Chef Dave shares his tips for pairing wines with grilled food. LoveToKnow (LTK): When people think of summer grilling, the first beverage choice that often comes to mind is beer. Why is wine a good option? Dave Lieberman (DL): Reaching for wine is just as simple as beer. Wine's various characteristics - from earthy to fruit-forward - enable a range of versatility to enhance a meal. For example, St. Francis wines are a great choice for the grilling season because they're big, bold and juicy - perfect to stand up to the flavors of flame-broiled meats and veggies. While to some this might be an intimidating feat at first, I've compiled St. Francis' Fast & Flavorful Guide to Grilling to show how you can easily make delicious, bold meals with perfect wine pairings at home. LTK: Are there any hard and fast rules for summer time food and wine pairing? There are no rules! The most important thing to remember when all else fails is drink what you like. Easy rule of thumb - generally speaking - light-bodied wines come from white wine grapes and pair well with chicken, seafood and grilled veggies. St. Francis' big, bold, fruit-forward red wines are perfect for grilled foods because of its rich tannins that give structure and depth. Full-bodied red wines enhance the flavors in most types of meat and freshly grilled pizzas. Food and wines with shared characteristics typically go well together. For example, a salt and pepper encrusted filet mignon tastes fabulous with a peppery Zinfandel like the St. Francis Old Vines Zinfandel. It wouldn't make sense to match very mild foods, like Dover Sole, with a big, flavorful wine because it will overpower the subtle flavors in the fish. Opposites attract. Serving a slightly sweeter wine offsets the spiciness in a dish. For example, St Francis Sonoma County Chardonnay is great when paired with spicy Asian dishes. Play matchmaker. An easy way to find a winning combination is to match the texture and intensity of food with an equally complex or simple wine. For instance, a basic shrimp scampi is really nice with Chardonnay, but adding hot red pepper and garlic makes Zinfandel a better match because the spicy notes in the wine compliment the spicy pepper notes in the dish. Forget the adage that you must serve white wine with fish. Try a grilled smoked salmon filet or swordfish steak with an elegant red wine, like St. Francis Sonoma County Merlot, and you'll be a convert! Dry (tannic) wines work best with high-protein food, like steak and aged cheese! Plus tannins help cleanse the palate of fats making your wine a refreshing complement to your meal. For example, tannins in the fruit forward, full bodied St. Francis Sonoma County Cabernet Sauvignon stand up to a great grilled steak to make an excellent pairing. A luscious wine, like St. Francis Sonoma County Chardonnay, will complement very rich foods. Another option is full-flavored wines with high acidity to cut through the oils in the dish. Acids pair with acids - think about it this way - would you squeeze lemon or lime into a glass of creamy milk? When you are drinking more than one type of wine with a meal, keep this suggestion in mind: white wine goes before red and lighter wines before heavier to help your palate adjust. LTK: A lot of people believe that white wines are really best for summer, and they avoid reds. Can reds be a good summer wine, as well? DL: YES! Especially when it comes to grilling, most people don't want to drink a white wine with a big juicy steak. You want something big and bold to stand up to the heavy, full flavor of the meat. Try a big, juicy red wine like St. Francis Old Vines Zinfandel or Cabernet. They are full flavor will really enhance the flavors from your grilled food. LTK: Chardonnay is a summer favorite. What would you pair it with? DL: I like Chardonnay with fish. The St. Francis Chardonnay has bright citrus notes and a touch of butter that pair beautifully with recipes like Classic Grilled Salmon with Lemon and Dill. Chardonnay can also pair well with vegetarian grilled dishes like Zucchini with Oregano Lemon Juice and Goat Cheese, since the flavors are still really bright and fresh, which goes well with this light, crisp white. LTK: Zinfandel seems like the ultimate grilling wine with its flavor profile. What grilled foods go especially well with Zinfandel? DL: Zinfandel is a deep, full and lush wine, with flavors of ripe black cherries, licorice, coffee and blackberry. That makes it perfect for equally juicy grilled meats, especially those with a slightly sweet-salty element like BBQ ribs, pork, or lamb. It's a versatile wine that can pair with a lot, just make sure you're serving it with big flavors. LTK: The "classic" Cabernet Sauvignon pairing for summer is grilled steak. What is your favorite summertime pairing with Cab? 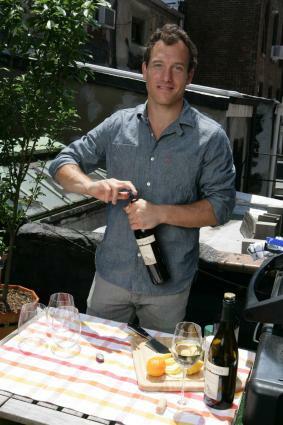 DL: Cabernet is strong, firm and full bodied, so marinated steak is really the best way to go with it. I like it with tri-tip or skirt steak, which you can marinate in fresh black pepper, Dijon mustard, steak sauce, soy sauce, and garlic. Keep it simple and bold with Cabernet and you'll be sure to satisfy any steak-lover. LTK: How about Merlot? With its soft flavors, it seems like the bold flavors from grilling might overwhelm the wine. How do you make the most of Merlot when you grill? DL: Merlot is ripe, lush and layered, filled with flavors of dark plums, chocolate and spiced vanilla, and you're right, you don't want to stomp out it's subtle flavors with something too bold or overwhelming. I'd say a pork dish, like my grilled Maple Syrup and Mustard Pork Tenderloin, is a perfect way to show how this delicate red can really stand out with grilled dishes. LTK: What are some great ways to use wine as an ingredient when you grill? DL: I'd encourage everyone to try using some wine in their cooking, it will make a pairing that much easier (just drink with the same wine you cooked with) and the bold flavors of the wine will add another layer to the dish you prepare. One of my favorites is the St. Francis Old Vines Zinfandel BBQ sauce that we created for the Fast and Flavorful Guide to Grilling (found on page 17). The juicy, full bodied wine makes this sauce an indulgent, full flavored delicious choice to slather on ribs or even grilled chicken. LTK: What do you like about the St. Francis wines for summer grilling? DL: I think that the variety in their line is really what stands out. No matter what foods you're grilling, there is a perfect complement in one of St. Francis' wines and the moderate price point makes it easy to experiment with new flavor combinations regularly. If you haven't checked out St. Francis' Fast & Flavorful Guide to Grilling, visit the Savor the Flavor website and get the fundamentals down. Then, try some of Chef Dave's special recipes and pair them with your favorite wine.